Nigerian Senate has ordered removal of speed bumps on federal highways across the country. 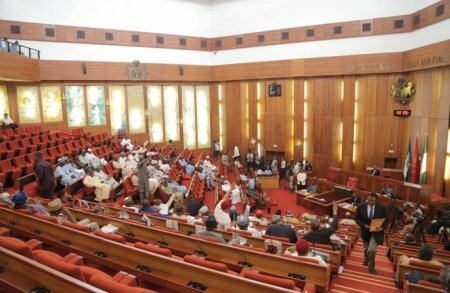 The Senators came to terms on this at the resumption of plenary of Tuesday while debating on urgent need to control the indiscriminate erection of speed bumps on Federal Roads Nationwide by Senator Barnabas Andyar Gemade, representing Benue North East constituency . While contributing on the motion, Senator Godswill Akpabio said the speed bumps should not be entirely removed across the country. Senator Mao Ohuabunwa later amended the section of the prayer to include regulation and standardization of erection of speed bumps on Federal highway. Senator Joshua Lidani supported the motion and noted that the pumps sometime lead to accident. Recall that the National Council on Works had late last year approved the constitution of a task force to sensitize Nigerians and facilitate the removal of illegal and inappropriate speed bumps from Nigerian roads. The taskforce was part of memoranda submitted by the Federal Road Safety Corps and the resolutions arising from the 22nd meeting of the National Council on Works in Katsina State with the theme “Prioritization and Optimization of Allocated Infrastructure Funds”.